Can you believe it? It’s already December 21st! There are only a few more days until Christmas – crazy! This month sure has flown by. I’m looking forward to a relaxing, low-key Christmas this year. Hopefully you’ve got some plans with family or friends to look forward to, and you’re pretty much all set for the big day. 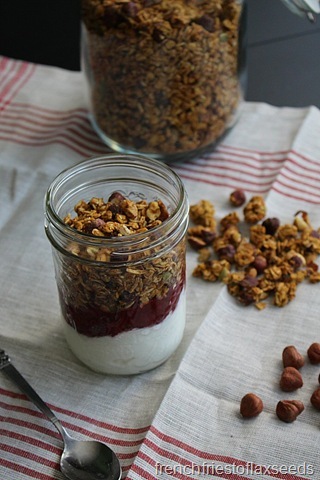 But if you are still looking for a few gifts, why not make something – say a tasty granola for that breakfast lover in your life? 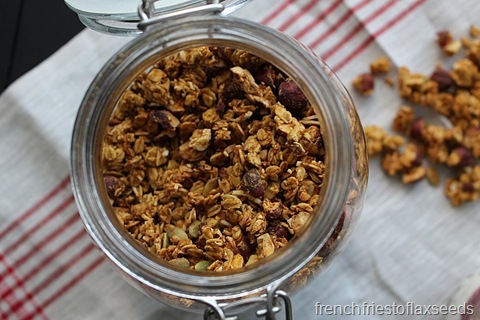 I saw this recipe for granola come across my Twitter feed a little while back, and saved it because it looked like something both myself and the boyfriend would enjoy. And as I’ve mentioned before, we always have pumpkin in the house these days. I kept meaning to give it a go, but you know how life is, always getting in the way. But I finally had the time and inspiration to get cooking, and boy was I glad I did. 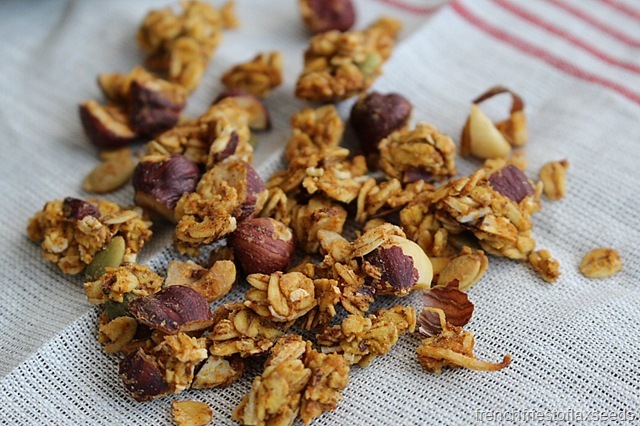 I’ve made granola a handful of times before. It’s relatively easy to make (stir up a bunch of ingredients and bake), but doesn’t always turn out the way I want my granola to be. 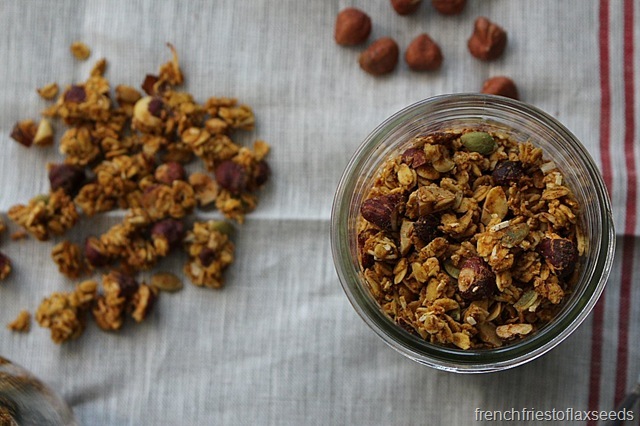 I feel like granola should be super crunchy, chunky, a little sweet, and full of delicious ingredients. I’ve definitely had some wins, but I’ve also had some epic fails, where the granola burnt before it got crunchy, or just didn’t taste like anything. But this recipe is a definite winner – I mean, just look at it! There are all sorts of delicious morsels here to satisfy your taste buds – pumpkin seeds, hazelnuts, coconut – seasoned with ginger, nutmeg, and cinnamon. It’s reminiscent of pumpkin pie, but also pairs well with any fruit you might add to your yogurt parfait – like this one with cranberry pear compote and plain Greek yogurt. So tonight, mix up a batch or two, and finish off those stocking stuffers, hostess gifts, or secret Santa presents with something homemade and delicious. Then kick back, relax, and enjoy the holiday season. 1. Preheat oven to 300 degrees. Line baking sheet(s) with parchment paper (my baking sheets are small, so I spread it over 2). 2. In a large bowl, combine oats, hazelnuts, coconut, pumpkin seeds, cinnamon, nutmeg, ginger, and salt. 2. In a medium bowl, combine pumpkin puree, maple syrup, coconut oil, and vanilla. 4. Add the wet mixture to the dry, and mix until well combined. 5. Spread the mixture evenly over the baking sheet(s). 6. Bake for 50 – 55 minutes, stirring every 15 minutes, until golden brown and crisp. 7. 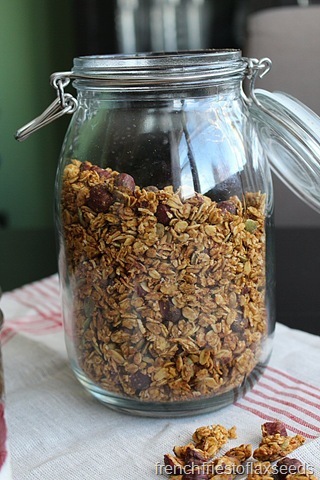 Allow granola to cool completely without stirring. Store in an airtight container. Notes: Substitute pecans, almonds, or your other favourite nut for the hazelnuts. Use certified gluten-free oats for a gluten-free version. Do you like to give homemade foodie gifts? Share some of your favourite gift giving recipes! -and these peanut butter muffins ( https://peanutbutterandle.wordpress.com/2015/09/13/peanut-butter-carrot-muffins/ ). I love homemade gifts! 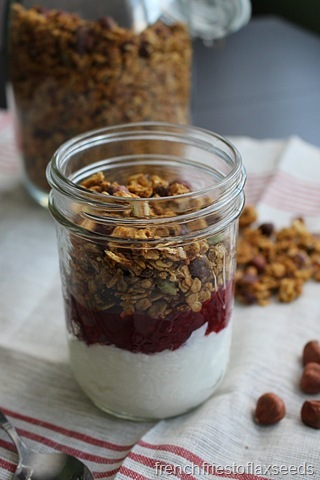 Your granola looks delish. This year I made my bosses macadamia nut, chocolate and craisin biscotti dipped in chocolate – I’ll be sharing the recipe soon – they turned out really well!